Minecon happened in 2013, and finally the custom map panel that I was a part of was posted on the teammojang youtube channel. So you can see the video in full right here! Of course I’m on it with a bunch of awesome people. We talk about all things map making including some answers about HB3… sort of. In any case it was a nice new year present for me, and I suppose for you if it’s something you wanted to watch! So happy new year, 2014 is going to be awesome. This webpage didn’t exist last year. It’s come a long way from its beginning only 8 months ago. Many people asked “where can I play all your maps?” So I decided to make a place where they were all in one place, a place where you can comment directly on the maps and where I could read it, a place that I could post stuff about what I’m doing next and a place that’s organised and easy to understand. Well, I got some of those things right with this page. To be honest when I started making maps I never would have thought I would have grown to the point where I would even need a website like this, but here it is, averaging 5-10 simultaneous viewers at any one time, and hundreds of visits every day, I am happy and surprised at what it’s become. My youtube channel has obviously become on the back burner since I’ve started doing a lot more heavy map making, especially now with stuff like Herobrine 3 that I’m working on. But I am still here, plugging away. I should though reiterate that this isn’t a job for me, I do it all for fun. I have a full time job elsewhere so if I’m too tired to make maps or whatever then I certainly wont and I’ll play some games instead. But I do enjoy making them which is why I continue to do so. Herobrine 3 did originally plan to release around this time but the stuff we’re doing in that map (sorry, no voice acting at this stage) take a lot of time. The bosses are epic if I do say so myself and certainly are something I don’t think anyone has done to this scale before. And finally there are my own projects that I am also working on. One such start up was inspired after I played rsmalec’s Tiny Minecraft mAPP. We are now collaborating on that project together and it’s pretty unbelievable to be honest. Sometimes I worry though because even on my computer it can chugg sometimes… there is a LOT of redstone in this one. It certainly wont be playable on low end pcs… or even high end laptops probably… but it’s something that people have wanted for a really long time and I think can be played again and again. I leave you with this screenshot of a little diagram that I was using for a while to help with the development of this map and thought I would share it with you as a little present. Enjoy and see you in 2014. Some people already know this, it was mentioned at Minecon 2013. But I was asked to help Hypixel with Herobrine 3. 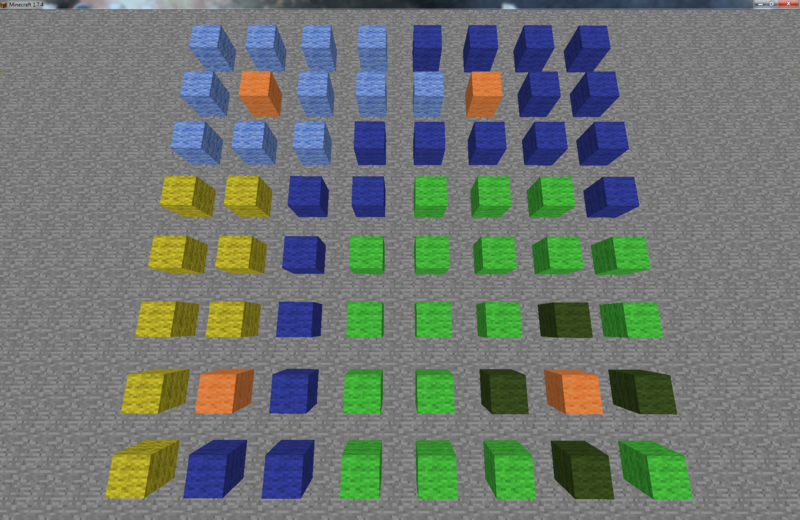 I am tasked with some redstone, some boss mechanics and some story building. Those of you who have played my maps before know I enjoy a good story (if sometimes a little convoluted, I’m looking at you Eronev 2) so I am hoping to flesh out the Herobrine legacy a little bit. It’s looking bigger and better than any of the previous Herobrine maps so far so you should definitely be excited. 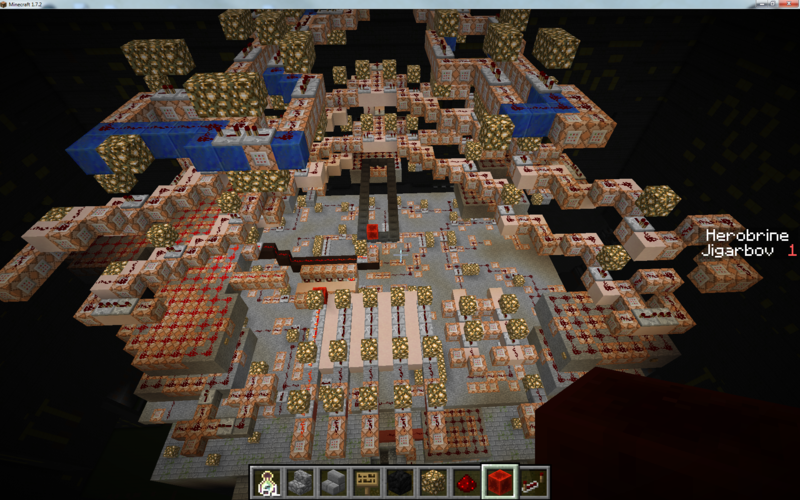 As a little teaser, here is the redstone for the first boss that I worked on. What you can see there is all me, it’s certainly unlike any boss you’ve seen before and I’m really looking forward to watching people play it and enjoy a Herobrine map with a healthy dose of Jigarbov inspiration inside. What about my own projects? Something might be in the works, but it’s too early to tell if it’s something that will be able to be done yet. It will certainly have to wait until Herobrine 3 is done though. Keep an eye out for it.